Cameron’s Cream Ale took the gold medal in the American Cream Ale Category for second year in a row. Breweries from around the world sent in more than 2500 beers representing 68 different categories for the 2013 U.S. Open Beer Championship. Judges from England, Canada and the United States announced the winners this week and more than 20 international breweries from Canada, Belgium, Germany, Mexico, Columbia, Sweden, Finland and England medaled in this competition. "The competition is really intense amongst all the fine products submitted from around the world. A number of our Cameron’s hand-crafted beers have been receiving medals consistently every year for the past four years at the U.S. Open Beer Championship, which means we must be doing something right,” says Bill Coleman, President and Co-Owner, Cameron’s Brewing Company. 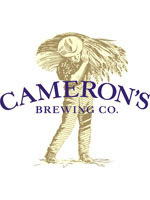 Cameron’s Cream Ale is the beer that started our company and was hailed by Toronto Life in 1998 as “best new beer of the year.” Cameron’s Cream Ale was described in a recent blog as ” a somewhat different take on the cream ale, possessing a strong malty taste and a clear British hop presence, but with a clean taste that is reminiscent of lager… a beer that is subtle and quite unique”.